Awesome! Fantastic! Amazing! 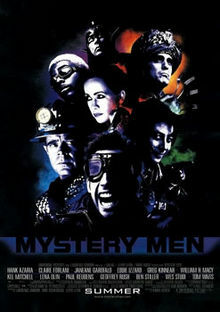 All words monster use to describe The Mystery Men. Soundtrack. Some terrific tunes in dis movie. Terrific! On de other hand, words monster use to describe de aktual movie = Meh. Okay. And Didn’t-make-monster’s-eyeballs-bleed-so-dere’s-dat. Movie offer promising premise of second tier superheroes who always being upstaged by top-tier hero, Captain Amazing. But when Captain Amazing captured by his arch-nemesis, Cassanova Frankenstein, our second tier heroes have to step up and save de day. Plot pretty linear but problem not so much predictability of story but fakt dat movie not all dat funny. Dere be a few funny moments but, mostly, Mystery Men made up of lost opportunities and lame gags. Charakters, for de most part, are interesting – even tho deir superpowers aren’t. But me tink dat de point. Blue Raja. Hey. He not blue! Blue Raja have power to trow cutlery wit more or less deadly precision. And also have power to talk like Stewie from Family Guy. He live at home wit his mom and, in one of movie’s high points, he reveal his secret superhero identity to mom who give him de speshul silverware for his big mission. 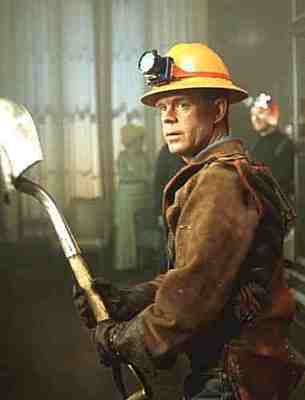 Shoveler just hit people wit shovel. Me like his superpower best as it someting us regular folks can aspire to. He have a family who care about him and his superhero job cause lots of friktion wit his wife (note: not de good kind). Me liked what we see of his home life and nice pay-off wit proud family at end of movie. Mr. Furious. A.k.a. Mr. Annoying-Douchebag. Mr. Furious superpower is explosive temper dat never really amount to much. He played by aktor Ben Stiller who keep his streak alive of being Super Irritating in every movie he ever been in. Congratulashuns to Mr. Stiller. Dat very hard to do. On de one hand, he not funny, not a very good aktor, and incredibly annoying. On de other hand…uh, on de other hand…hmmm, where de other hand? 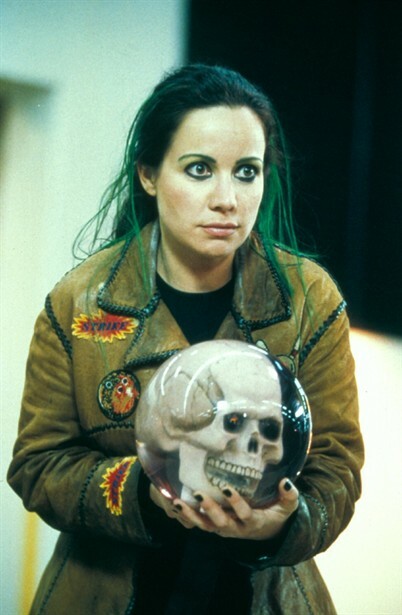 The Bowler trow bowling ball (containing skull of dead dad) wit deadly accuracy. Rounding out de crew is Invisible Boy (who got his powerz becuz nobody notices him and can only turn invisible when no one looking – an idea “borrowed” by de show Misfits), and De Spleen who knock people out wit his fartz (in movie’s lamest running gag). – Cassanova Frankenstein and his lootentants, Tony P. and Tony C., leaders of De Disko Boyz! 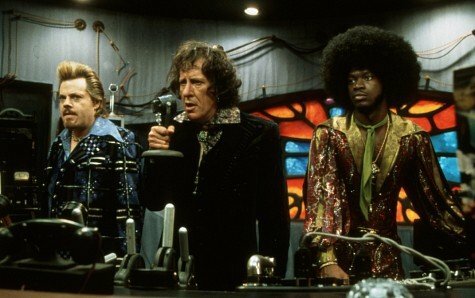 Anyway, Mystery Men crash party Cassanova Frankenstein is hosting in bid to reskue Captain Amazing. Dey get off to a rough start by accidentally killing Captain Amazing, but finish strong by stopping Cassanova Frankenstein from unleashing his ultimate weapon…De Psyko-Frakulator! Verdikt: Great potenshul but weak exekution. Less high points (“You must lash out with every limb, like the octopus who plays the drums.”) den low points (Every scene wit de Spleen, humpy skunk, surprizingly unfunny superhero try-out sekwence). 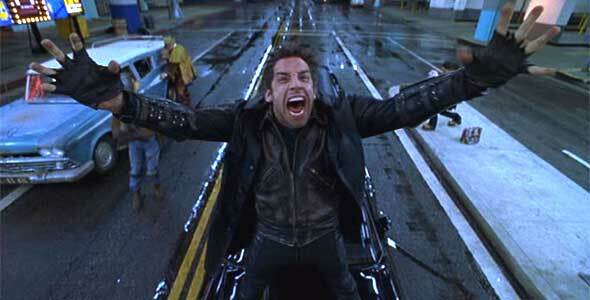 Ben Stiller consistently terruble. 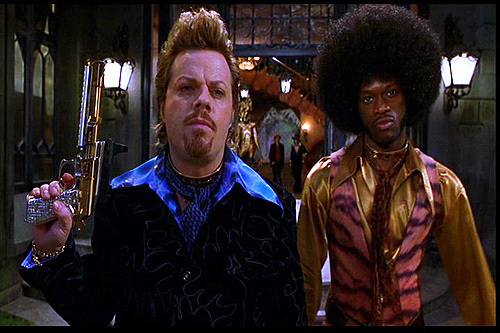 But Eddie Izzard as Mr. P be absolutely fabulous! Still, like me said – monster’s eyeballs didn’t bleed. Rating: 6 chocolate chippee cookies.